I love these because reading these personal notes and reflections from writers is like looking at an artist's train of thought doodles. It's fun and interesting to pick your brain on the process so thanks for sharing. I may have more thoughts later. Also, massive amount of respect to you for writing a piece of work NOT in your native language. I would need YEARS to get to that level. TazKat wrote: I love these because reading these personal notes and reflections from writers is like looking at an artist's train of thought doodles. It's fun and interesting to pick your brain on the process so thanks for sharing. I may have more thoughts later. Glad you like it and it's good to know that this is also interesting for people whose focus isn't on fan fiction writing (Please correct me if I'm wrong in your case). TazKat wrote: Also, massive amount of respect to you for writing a piece of work NOT in your native language. I would need YEARS to get to that level. Thank you very much for that compliment, TazKat. While I was working on the story, I sometimes imagined how it would look like as a comic. I knew right from the start that it wouldn't be possible to do it that way as this would have been a tremendous effort. It would be way too expensive to hire an artist for it and it would also be a nightmare for any fan artist as this would probably take years to complete. I think the Nova Squadron comic is a good example for this, as it is already in the making for about two years now and there is probably still a lot to do before it's actually finished. The progress on this project is moreover slowed down by real life issues which is perfectly understandable. So please don't get me wrong, Poecat and Felony, as I really admire what you are doing and I'm really curious how the story will continue. But I think in this context it helps to make clear that people (especially non-artists) never should underestimate the effort of such a project. Still, the idea of having art accompanying the story was there all the time as I naturally always had images in my mind when writing. As they sometimes manifested as single images from a comic strip I thought it would be cool if the story would include at least some illustrations that this should be way easier to be made than a whole comic. Though not being an artist myself I fortunately know a few people having that talent. So I contacted one of them of whom I thought that he would be able to emulate the style of the show. 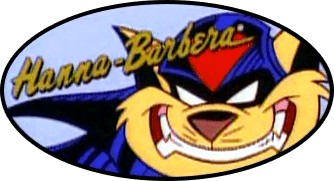 Jan wasn't really aware of SWAT Kats and only knew them from a book dealing with the history of the Hanna-Barbera studios. Nonetheless he agreed to give it a try. It was clear to me that he couldn't do it for free because as a freelancer he needs to be paid for this in order to survive. But as we already knew each other for quite some time he made a special offer for me. You may ask why I didn't contact a fan artist who wouldn't charge anything. Well, I had several reasons for this. First, I don't know any fan artist in my area and as this was the first time I acted as a commissioner I wanted to have someone who I could trust and whom I could talk to face-to-face. Second, if it's a paid job you (should) have the right to demand subsequent improvements if the result isn't what you and your contractor agreed on. Third, you can agree on a certain deadline which has to be kept by the contractor (I was very flexible with this actually as I preferred quality over to-be-on-time). But it was assured that I would get what I ordered within a reasonable amount of time and not "when I have some time left to do it... someday... somehow..."
Fourth, a professional artists has (or should have) a working pipeline that allows the commissioner to have an insight into the creation process allowing him or her to discuss changes before the image is actually completed. Fifth, I wanted to pay for the images out of respect. Furthermore it allows me to use them the way I see fit. Next time I'm gonna talk about the groundwork I did for Jan before he actually started working on the illustrations. This is a lot of stuff, so let's go through it step by step. I mainly split everything up into Descriptions, ProductionSheets and Story. The Descriptions-folder includes an instruction document explaining what should be displayed in the illustrations and how Matthew Doubt, Specter, the drones, the mosquito drones and the power draining missile would look like (I'm getting to this document more detailed later). As it includes a lot of images (mostly screenshots from the episode guide of swatkats.info) I've additionally put these images into the references-subfolder if Jan wanted to load any of them directly into his image processing application as reference material. The ProductionSheets-folder is containing multiple subfolders, like character model sheets or size comparisons that contain the images downloaded from the exclusive sections. Finally there is the Story-folder containing a work-in-progress version of War Games as a pdf-file. When Jan had taken a first look at the content of the CD he told me that he would need about two days just to examine all the material in detail. So I guess he didn't do that and only took a look at some of these reference whenever it was necessary. I also gave him my SWAT Kats DVDs such that he could watch the episodes I'm mentioning in the foreword of the story. In the end a lot of characters and items corresponding to the material I've collected don't appear in the created illustrations, because we reduced the amount from 25 to 9 illustrations. I knew right away that Jan probably wouldn't be able to create 25 illustrations for a reasonable price and within a reasonable amount of time. But as I wasn't sure how much illustrations he would be exactly able to do I wrote the descriptions for all of them in the instruction document and also gave them a priority (P1 => must be included, P2 => should be included, P3 => nice to have). This made it easier to discuss how many images could be made and it helped me to decide which ones I really really really wanted to have. Reducing the amount of image also reduced the amount of different characters to be drawn. Although this limitation of characters wasn't done by me deliberately it probably made it easier for Jan as he didn't have figure out how to draw Callie, Felina, Commander Feral, Burke's and Murray's dump truck, the computer console at Puma-Dyne, etc. who/which would have been appeared in some of the other illustrations. In the end my best-of-choices "only" included Chance/T-Bone, Jake/Razor, Matthew/Specter, Hard Drive, Dark Kat, the Turbokat, the drones and some backgrounds. But you can believe me that every illustration I had to drop felt like a stitch into my heart, especially as I also had to drop a few of the P1-illustrations too. Next time we are going to take closer look at the instruction document. So I'm finally gonna start to show some images in this thread. Last edited by Mr. Goodkat on Tue Apr 12, 2016 5:34 am, edited 1 time in total. The instruction document starts with explaining some general things like how the technology has been progressed in Megakat City in five years (I assumed that it only took five years to develop all the stuff which we have developed in the last twenty years, like flat-screens, smart phones, etc.). 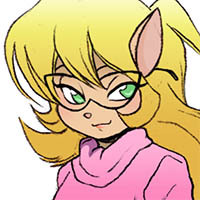 I also explained the meaning of the priorities (P1, P2, P3) and included a few links to swatkats.info just in case I had missed something during my research that Jan would need. Next I described the new characters and items. Here is an excerpt with the description of Matthew Doubt. He is a bit smaller and has a bigger belly than Jake Clawson. He has white fur with a pattern of light gray stripes. He wears a grey shirt having a black line running from its top to the bottom. This line covered a zipper which he had zipped up to the round collar of his shirt. Below this description I've added an image from a website were these kind of shirts are sold which I don't want to post here to avoid making covert advertising. He wears a pair of blue trousers with a black belt. He wears a pair of white sneakers with red lines on their sides. At the end of the story he wears a gray hoodie with a zipper instead of his shirt and coat. I have to admit that I was a bit worried that Jan wouldn't be able to get close enough to the original style as I wanted it to have when I first saw this image. 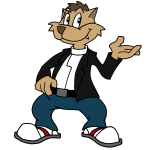 In this image Matthew looks more a like a character of a modern Top Cat show to me than a kat living in Megakat City. But Jan also wrote me that he would like to change some things (mainly the thickness of the lines) and with these information I could imagine how it might look like and thought that this could really work. We also agreed that Matthew shouldn't have stripes in his face as this would have been too complicated and it's rather unusual for the characters in the show (IIRMC only Tiger Conklin has stripes in his face). After looking at the image for quite a while I fell in love with it and got excited to see how Matthew would gonna evolve. This image also affected the story because I realized that the character looked a bit weird to me with his upper body being black-and-white only and his lower body being rather colorful. As his fur is dyed into Jake's/Razor's color at some point in the story I initially wanted him to have a color which allowed this very easily. But then I decided to change the color of his fur to one being similar to the one Chance/T-Bone has as this should make it still possible to dye it nonetheless. So if you create a new character in can be very helpful if you can draw him/her or know someone who can do this for you (Actually I'm a bit jealous of Kooshmeister for having both talents, being a writer and and an artist ). I think it's important to discuss this with your illustrator upfront before doing as I can imagine that some artists might get upset when you add some changes to their work, although your intention is just to make it more clear what exactly you want to have changed. I think with these body proportions Matthew should fit quite well into the SWAT Kats universe. Next time I'm gonna show you some material of Matthew's alter ego Specter. He appears to be bigger and more massive than Matthew, although it's the same character (because of the SWAT Kats outfit, see also the note in the production sheets of Razor). He wears a long sleeve flight suit like Razor (it's actually one of Razor's spare suits). He has the same fur color as Razor in some of the illustrations (please check the illustration notes for it). All concerned illustrations were never created, unfortunately. 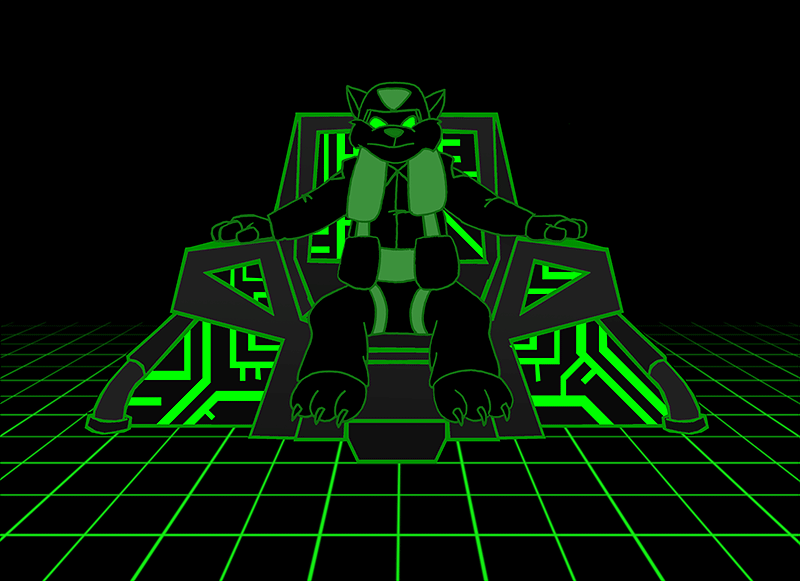 He's depicted as a green wireframe while being in Cyberspace. The notes in the brackets were actually additional information for Jan. In this scene not being is alter ego (unlike depicted above), Matthew is being electrified by Hard Drive and didn't even know the SWAT Kats personally back then. As I originally also wanted to have a "It's payback time"-illustration depicting Matthew (as Specter) punching Hard Drive in the face, Jan mixed up these two scenes for some reason. If it would have been this way I'd say that this is a very bad start to be a SWAT Kat. I'm starting to feel even more sorry for Matthew now, thinking of what we did to him. In the next post I'm going to show how the production pipeline for creating the illustrations looked like by using one of them as an example. The level of planning and attention to detail you gave in your overall process is very refreshing, and I think those of us who dabble in fiction could benefit by incorporating some of your practices. A lot of writers won't even bother to outline their ideas before they start writing, which often results in a chaotic narrative that oftentimes results in unfinished work (not that I've ever done that myself ). The coordination you had to do with an illustrator also presents a new dimension to the process. I'm tempted to do a self-analysis myself now of some of my humble works (though I doubt anyone would actually care ). MoDaD wrote: The level of planning and attention to detail you gave in your overall process is very refreshing, and I think those of us who dabble in fiction could benefit by incorporating some of your practices. A lot of writers won't even bother to outline their ideas before they start writing, which often results in a chaotic narrative that oftentimes results in unfinished work (not that I've ever done that myself ). The coordination you had to do with an illustrator also presents a new dimension to the process. Why, thank you, MoDaD. This almost too much compliment for me to handle. I'm really glad if this helps other writers too improve their works. MoDaD wrote: I'm tempted to do a self-analysis myself now of some of my humble works (though I doubt anyone would actually care ). Actually I would, because I only know about my own experience with (fan fiction) writing and some additional insights I had during the PM-discussion with Kooshmeister. But I have to admit that I haven't read any of your works yet. I'm going to explain the production process by using one of my favorite illustrations which depicts Razor starting to order Specter around. I like it very much because it shows Razor in a way you haven't seen him ever before (at least in the show). Although some of you may have a hard time to imagine that Razor would really be capable to act like this, it makes sense in the context of the story as Matthew has to take part in the Puma-Dyne infiltration, but is absolutely not fit enough to do it at that point. So Razor has to change that immediately and there is not much time. Therefore he starts to train him in a way which should be very effective, but isn't enjoyable for Matthew at all. "Me?" Matthew asked surprised. "Well, I'm a programmer... Which means that I'm sitting on a chair most of the time and I'm also a rather lazy guy, not to mention that I just came out of hospital. So I think I could be in a much better shape than I'm actually am." "Then we have to start working on that right away." Razor noted. "What do you mean?" Matthew asked confused. "What does my physical fitness have to do with this?" Razor suddenly got a grim look on his face and raised his voice. "Matthew, do you really think we can enter Puma-Dyne through the front door while they roll out a red carpet for us? No! We'll have to sneak in, get onto the roof and crouch through ventilation shafts. We'll also have to move around quietly and stay out of sight the whole time." Matthew looked embarrassed at Razor. "I haven't thought about that, Razor." "It won't be possible to take you on our shoulders or hold hands. That's why we need to get you in shape as good as possible in the short time we have." Razor went over to his locker and opened it. Then he grabbed a spare flight suit and a spare helmet and threw it over to Matthew. Matthew was a bit smaller and more corpulent than Razor, but still he should be able to wear his flight suit. Matthew now looked completely confused at Razor. "What are you waiting for, Matthew? Dress up! We haven't got all day, you know." Razor commanded in a tone he used to know when he and T-Bone were rookies back at the Enforcers. "Okay, okay." Matthew said and started getting into the flight suit. "But could you please explain what this is all about?" "Simple." Razor started to explain. "You cannot show up at Puma-Dyne as Matthew Doubt, right? So you have to be disguised when you and T-Bone infiltrate it." "Me and T-Bone?" Matthew asked. "And what about you?" "Everyone knows that there are two Swat Kats, right? What do you think would happen if suddenly three of them would be seen? It would probably raise unnecessary questions and since Feral has already seen us together he may figure out who the third Swat Kat might be. That's the reason why I'll stay in the background and monitor your progress from the outside whenever possible." "Sound reasonable. But there's still be a problem." Matthew argued, who just had finished dressing up. "And what would that be, rookie?" Razor asked determined. "I mean, look at me. Even if I'm wearing your flight suit, mask and helmet you can still see my fur, which has a much lighter color than yours. So I still don't look like you at all." "That's right." Razor replied with a slightly mean smile on his face. "That's why we'll have to dye it before you go in there." "Dye my fur? You can't be serious, Razor." Matthew complained. "Hey! Who had the idea to infiltrate Puma-Dyne in the first place?" Razor countered and then fell back into drill instructor mode. "So stop complaining and follow my orders! You are a Swat Kat's recruit now and we haven't got time to argue!" "Yes... sir." Matthew replied not very confidently. From the look on his face and his posture one could easily determine that he felt pretty intimidated by Razor now. Razor realized that, of course, but ignored it. "Good! Now get through that door over there!" he ordered and pointed with his finger towards a door behind Matthew. "It leads to our underground training course. I want to see you at the starting line on the double! Then we shall see what you are made of, recruit!" Matthew gulped, turned around and moved quickly towards it. When Razor was about to follow him he felt T-Bone's hand on his shoulder. "You got a minute, buddy?" T-Bone asked. I forgot to describe where the three are actually standing in the illustration. But I explained it to Jan later on when we had lunch together. This is something I recommend to do if you have the opportunity to meet up with your illustrator in person. We had several of these lunch-meetings and it definitely helped us to stay on track. If it isn't possible for you to meet up in person, a Skype session might also be a good alternative as this is more flexible than an e-mail correspondence. This is something I would definitely not like to post on Deviantart , but it's quite sufficient as a starting point in order to create a draft image. Now seeing this tells me that it was a good idea NOT to participate in the SK Secret Santa Art Trade and it should also make clear why I needed an artist for the next steps. When I first saw that image I laughed for a minute at least, because Razor looks really really mean in a way one would never expect (please tell me if you think he don't). I especially like it how he has placed his left hand on his harness while pointing with the finger of his right hand at Specter. This is exactly how I'm imagining the posture of a drill instructor. T-Bone also looks like I've imagined him. But there is one thing that doesn't fit and this is Specter's posture (although he has been drawn very well and really looks like Matthew in a SWAT Kat's outfit). So let's recap the description I'm referring to: "Specter looks at Razor, being startled and intimidated". Specter may look being intimidated, but he's absolutely not startled or surprised or anything like that. He rather looks like as he has been in this situation at least once before and knows exactly, that Razor is gonna give him a rocket. I've imagined him being rather scared, almost being thunderstruck. More like "Why is Razor shouting at me all of a sudden? What's happening here?". Please have in mind that this is actually the first time in Matthew's life that he's being treated like that. Maybe he could draw back his upper body a bit and let his hands and arms be in a clumsy defensive position. Yeah, this is definitely more like it! It's very improbable that the illustration you'll get from your illustrator will look 100% like that what you have made up in your mind. This is because the artist can't look into your brain. So, the more detailed you describe everything the more accurate the illustration probably will be. But you also have to keep the skills and experience of your illustrator in mind. Only because you've written everything down as accurate as possible doesn't mean that your illustrator will be able to draw it exactly in that fashion. On the other hand, when you're not being so accurate with your descriptions (like I was) it may allow the illustrator to be more creative which may lead to a more interesting result than you've originally imagined. Therefore I think it's a good idea to discuss this with your illustrator upfront. Whenever Jan drew something in a different way in a draft, we discussed it and in many cases these deviances actually made sense or even improved the scene. An example for this is the cover page where Hard Drive, Dark Kat, T-Bone, Razor and Specter are posing. I originally wanted to have Matthew in it, but Jan thought that Specter would fit better into this group and when I saw the draft I agreed with that idea (I just love the way he looks, having that typical cheeky SWAT Kat smile on his face). My only concern was, that this spoils the twist that Matthew actually will become a SWAT Kats recruit. On the other hand, it's kind of predictable, isn't it? Another example leading to an improvement is the Cyberspace scene. In the description of the image I didn't mention a grid floor, but Jan added one and showed me both images, one with and one without the floor. The one with the grid floor definitely looks cooler to me, so I picked that one. So, what I want to say is, that you shouldn't be a dictator when you commission an illustration. But on the other hand you shouldn't be dictated by the illustrator of course, especially when you are the one who is actually paying for the show. Both sides should be prepared to compromise and be open for discussions. I think you gonna get the best results with such a trade-off. I may point at the obvious here, but I think you should always have this in mind in order to have a good collaboration and to avoid unnecessary conflicts. So, this is how our production pipeline worked. Next time I'm going to show another illustration which led me to change the story a bit at some point. Last edited by Mr. Goodkat on Mon Dec 21, 2015 11:51 am, edited 1 time in total. Mr. Goodkat wrote: But I have to admit that I haven't read any of your works yet.